Chris Dolack will succeed Tim Christman, who has served as series director for the past 10 years and has chosen to take a step back to spend more time with his family. Dolack brings a wealth of experience to his new role. Having served as Vice President of Media and Public Relations for the World of Outlaws and DIRTcar from 2005 through 2015, he has earned the respect of drivers, teams, promoters and fans alike, and is familiar with the inner workings of the Series and dirt track racing in general. “My heart is in dirt track racing. 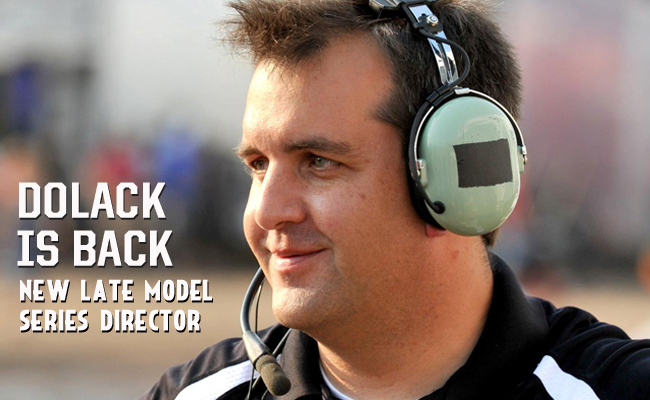 The World of Outlaws Late Model Series is the pinnacle of the sport, and I’m honored to have this opportunity,” said Dolack. During his two years away from the World of Outlaws, Dolack has maintained close ties with the organization while helping to grow SPEED SPORT, overseeing the development of one of the motorsport industry’s leading media companies. But Dolack is a road warrior with a strong history in dirt racing running back nearly 20 years. Chris Dolack cut his teeth covering the Western Pennsylvania scene for the Pittsburgh Post-Gazette, including his self-proclaimed home track, Lernerville Speedway. During his first stint with the World of Outlaws Dolack’s role took him on the road with the Sprint Car Series, Late Model Series, Super DIRTcar Series and Summer Nationals. He also took a leadership role in many of dirt track racing’s biggest events, including the DIRTcar Nationals, Firecracker 100, Super Dirt Week and World Finals. The World of Outlaws conducted a national search that generated a great pool of applicants. “After an extensive interview process with a number of highly qualified candidates, we stood unanimously behind Chris,” said World of Outlaws President Tom Deery. Christman has agreed to continue as Series Director through May 28, working in support of Dolack to ensure a smooth transition, after which he will continue as a consultant through the end of the 2017 Season.